Jay Gould had just then reversed the commercial morals of the United States. He had put a blight upon them from which they have never recovered, and from which they will not recover for as much as a century to come. Gay Gould was the mightiest disaster which has ever befallen this country. The people had desired money before his day, but he taught them to fall down and worship it. They had respected men of means before his day, but along with this respect was joined the respect due to the character and industry which had accumulated it. But Jay Gould taught the entire nation to make a god of the money and the man, no matter how the money might have been acquired. In my youth there was nothing resembling a worship of money or of its possessor, in our region. And in our region no well-to-do man was ever charged with having acquired his money by shady methods. The gospel left behind by Jay Gould is doing giant work in our days. Its message is "Get money. Get it quickly. Get it in abundance. Get it in prodigious abundance. Get it dishonestly if you can, honestly if you must." What would Mark Twain have said about Goldman Sachs? About 21st century corporate greed? About Citizens United? George Carlin says it best. Twain would be the first one with a rope to hang them while writing a news report how he did it! 1). My e-edition of the Mark Twain Autobiography weighs much less than 40 lbs. 2). I've been wondering a lot lately about this kind of comparison as I try to figure out how far back Ryan and his ilk are trying to take us - 1984? 1929? or further. 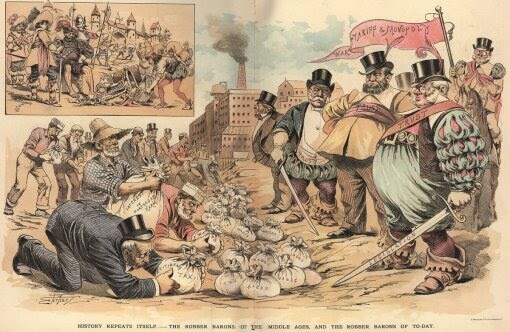 And I did eventually realize that it most resembles the era of the robber barons. 3). Bill Moyers has a less comical, though very insightful portrayal of this issue here, using the borrowed term "plutonomy": http://www.youtube.com/watch?v=FSoglDcRbAg&feature=related. Remember when teachers, people with disabilities, public employees, Planned Parenthood, NPR and PBS crashed the stock market, wiped out half of our 401Ks, took trillions in TARP money, spilled oil in the Gulf of Mexico, gave themselves billions in bonuses, and paid no taxes? We should punish those bastards by hammering them in the state and federal budgets! Call your representative and demand action! In your holier-than-thou attitude, you told others in an earlier post some time back that personal attacks would not be acceptable in comments. What you really meant was you would not accept personal attacks from conservatives and anyone who doesn't agree with me. You are a hypocrite and low class one at that. I am sure this will never get posted, but this is really all you have ever been. This is why people in your own party cannot stand you. Thankfully, most people on both sides of the political aisle in this community know this and just let gas bags such as yourself be, well, gas bags. Would you consider my posts to "retired educator" a few threads down constitute a personal attack? I questioned his or her integrity, tolerance for diversity, and even English grammar, punctuation and spelling. My posts were printed. Maybe you are doing it wrong?
" you told others in an earlier post some time back that personal attacks would not be acceptable in comments. " "Anonymous" will do anything to distract folks from commenting on the actual content of a thread. Especially since the content of THIS thread is interesting. Thank you, Shyster, for putting your tongue so firmly in your cheek to capture the essence of the attack on the middle and working classes by the legislature and the congress.